Framework. It's more figurative than literal, though some of the artwork in the exhibitions featured below do live within frames. But mostly, we're talking about framework as in structure—the bearings and organizational processes particular to each artist's craft. Whether it be photography, painting or sculpture, the works feature minute details and interesting perspectives just begging to be unpacked. 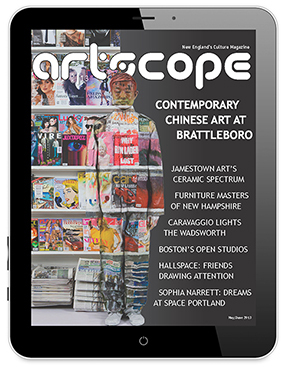 Also of note: Our March/April 10th Anniversary issue is fast approaching! Please feel free to contact us if you would like to advertise in the issue. 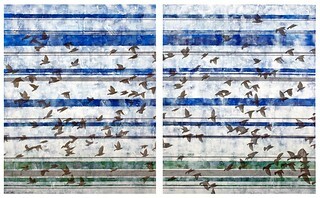 Hydrogen 1 by Sarah Hulsey. Explorations are often accompanied by maps, but what is a map really? As a metaphor, map could mean anything from direction to adventure, and the artwork in the upcoming exhibition at Maud Morgan's Chandler Gallery offers plenty room for interpretation. Schemata showcases printmaker Sarah Hulsey's pictorial representations of words and ideas with Rhonda Smith's abstract paintings that evoke geological forces in motion. Hulsey says that printmaking, with its emphasis on "repetition, seriality and discrete marks built up into larger forms," allows her to "visualize the complex systems behind language." Just as atoms are the building blocks of matter, Hulsey constructs names of chemical elements from their phonemes, the building blocks of speech. 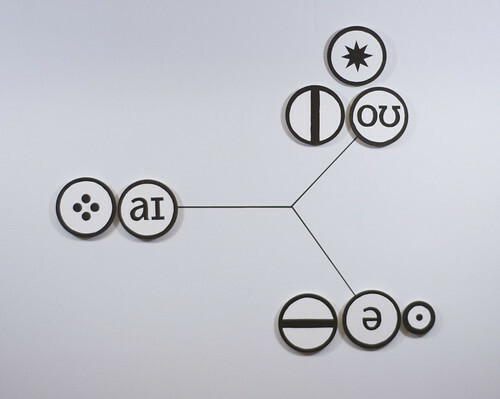 Hulsey's "Hydrogen" (featured above) looks like a diagram of a molecule, but the symbols in each unit are linguistic, rather than chemical. As Hulsey poses puzzles to viewers, Rhonda Smith investigates the collision of land and water through paintings of exploding color and texture. Her new work is influenced by maps, ancient Chinese scholars' rocks and the dynamic forces active in water and land exchange. Smith is fascinated by "the human impulse to explore what is around the next bend...[and] to allow the unknown to impress itself upon us." 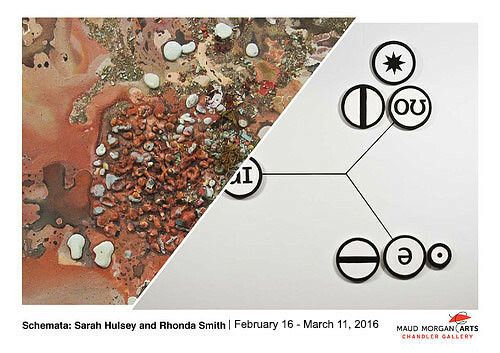 Schemata: Works by Sarah Hulsey and Rhonda Smith is on display at the Chandler Gallery from Tuesday, February 16 through Friday, March 11. The opening reception will be held on Thursday, February 18 from 6 - 8 p.m. Maud Morgan Arts is a program under the umbrella of the Agassiz Baldwin Community, a private nonprofit organization with a forty-year history of quality programs and services in the Cambridge community. Maud Morgan Arts comprises a full arts program of classes and workshops for all ages, the Chandler Gallery and a collection of original art by noted artist and community resident Maud Morgan. 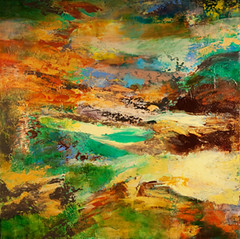 Diane Novetsky's paintings explore the natural world, its waters, skies and landmasses, to invoke the Earth's ecosystem in all its wonder, fragility and transience. They are not depictions of landscape, but transformations that suggest the weight of water, the collision of land formations and the luminosity of sky. Grand Circle Gallery announces its 5th Annual Student Travel Poster Design Competition for undergraduates studying Graphic Design at a New England college. Submit an original vintage travel poster design and win CASH! Submission deadline is April 5, 2016. 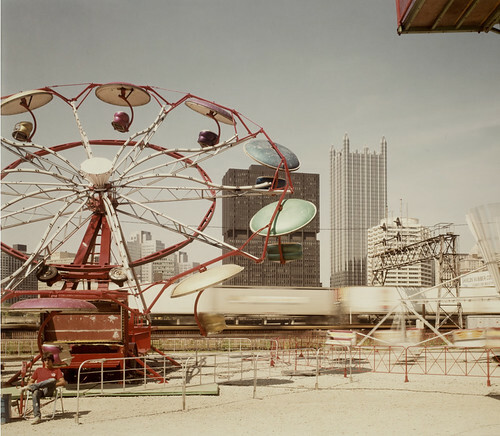 Pittsburgh, Carnival and Train (Detail) by Joel Meyerowitz,1946, vintage chromogenic print. A recent gift to the Mount Holyoke College Art Museum has turned into a season-spanning exhibition focused on light in photography. Fragile Paper Timeships features a selection of vintage chromogenic prints by renowned photographer Joel Meyerowitz and explores the period of the artist's career following the publication of his influential book Cape Light in 1979. In the following decade, Meyerowitz deepened his investigation of the descriptive power of the large-format view camera and learned, as he later reflected, "to photograph without looking" and trust his sensory reality. A master of color photography for more than four decades, Meyerowitz catches fleeting sensations in his images, rather than just objects of observations. "His photographs from this period," notes exhibition curator Hannah W. Blunt, "reflect an interest less in objects than in spaces, or what Meyerowitz called 'fields of force' created by light." The centerpiece of the exhibition is a group of photographs of land, sea and sky near the artist's summer home in Provincetown. These images explore the effects of light on each layer of the landscape—the kinds of intense details Meyerowitz prefers in color photography. Also on view are portraits of Meyerowitz's friends, family and acquaintances by the Cape Cod shore, as well as a number of still lifes and other landscape views. Fragile Paper Timeships is on view now through Sunday, May 20 at the Mount Holyoke College Art Museum. Idella Plimpton Kendall Professor of Art History Anthony Lee will give an Art à La Carte Gallery Talk, "Color Photographs in a Black-and-White World" at 12:20 p.m. on Thursday, March 3 in the Museum. The Museum will also feature an exhibition of rare Navajo weavings as well as two related collection spotlights. 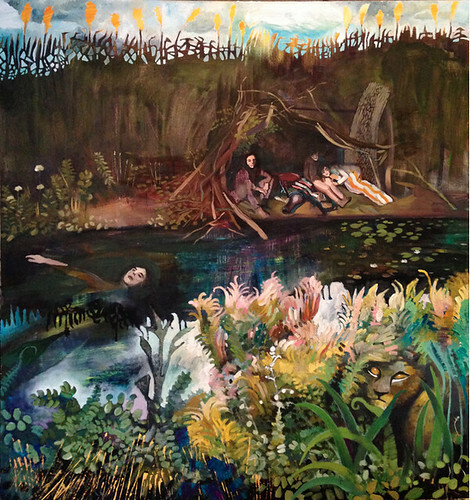 Wetlands by Liz Garagas, oil on unstretched canvas. Despite their different mediums of choice, the two featured artists in Coastal Living Gallery's current exhibition share more than the same first name. E2 features paintings by Elizabeth Gargas and sculpture by Elizabeth Lind, all of which have a heavy focus around the female form and character. In Gargas' newest series, her paintings present a stage upon which a story of gritty truths unravels. Because the work is largely personal, many of the frames feature a female character amongst other features, crouching in tall grasses or floating down a wetlands river with arms spread. Of her intentions, Gargas says, "Humans have a tendency to covet ideas and experiences as a way of definition and identity. I am interested in reflecting that notion by constructing a space filled with these coveted things. The things are experienced and found: a composition, a feeling, a moment of light, a dream or a memory that have been collected and curated over the years." Elizabeth Lind continues to feature the female form as she explores the context of the female experience through her works of sculpture. The sensuality and timelessness of being female lives in the center of her art and the incorporation of symbols provides a unique language to express emotions, sexuality, relationships, vulnerability and strength. "All of my art making is tied to sculpture as I gravitate to the concrete presence of three-dimensional form," Lind says of her process. "Most of my works are stone as I love the fluid nature of direct carving—searching for forms under the skin of the stone's surface and working towards a simple elegance." Lind also creates clay and mixed media sculptures to offset the time-consuming carving process of stone and to practice flexibility. The works of both Elizabeth's are on view in E2, showing at Coastal Living Gallery now through Friday, February 26 An artist reception is set for this Saturday, February 13 from 3 - 5 p.m.
Painter Rhonda Smith and printmaker Sarah Hulsey are turning cartography on its head. Their upcoming show at the Chandler Gallery, "Schemata," showcases the artists' different approaches to mapping as metaphor. Hulsey combines theoretical linguistics with historical diagrams to create pictorial representations of words and ideas, while Smith's abstract paintings evoke geological forces in motion.